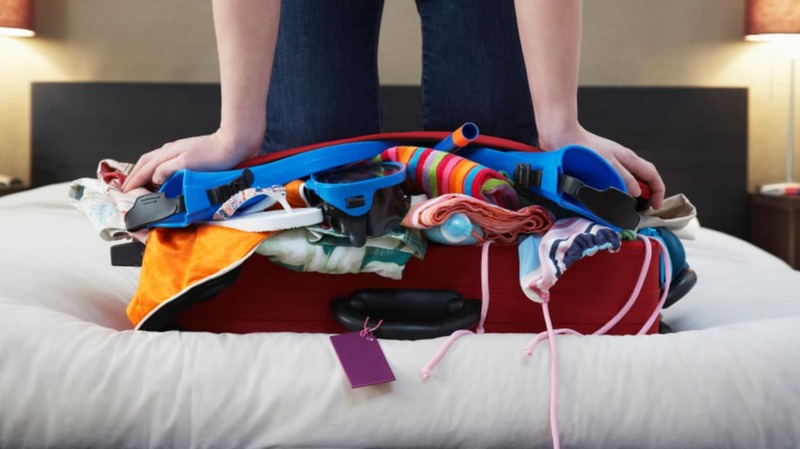 You could pare down everything you’re planning to bring on vacation to a knapsack-sized set of bare necessitates—or, you could get strategic about your suitcase. Master these 11 handy tips for packing like a pro and never have to “make do” when away from home again. 1. USE KITCHEN BASICS TO KEEP DELICATE NECKLACES FROM TANGLING. If you have one tangle-prone necklace, try threading it through a plastic straw to keep the length of chain from twisting around itself. If you’ve got a whole set of jewelry that tends to get knotted up, use cling wrap to keep things tidy: Sandwich your jewelry between two pieces, making sure to seal the spaces between individual items. 2. KEEP EARRING PAIRS TOGETHER WITH BUTTONS. Any button with at least two holes will work to keep your tiny earrings from drifting apart. Just stick each one through a hole and attach the backs. 3. USE SOCKS TO PROTECT BREAKABLES. Don’t risk surpassing your liquid carry-on limit by stashing glass toiletries—like perfume or cologne bottles—in your hand luggage. Instead, give them a little extra cushioning inside your checked bag by tucking each breakable item inside extra thick socks. 4. ADD PLASTIC WRAP TO SEAL FLIP-TOP CREAMS AND LIQUIDS. Things like moisturizer, sunscreen, or anything else with a flip-top and squeezable body tend to burst open and ruin everything else in your suitcase after even a small amount of jostling. A plastic bag works to contain the mess, but it doesn’t save your lotion. Instead, seal the lotions at their source by placing a small piece of plastic wrap under the lid. Just unscrew the top, lay a piece of plastic over the opening, and re-screw. 5. ROLL YOUR CLOTHES; DON’T FOLD THEM. This will save space in your suitcase and should help prevent wrinkles. Rolling has the added advantage of making it easier to see everything you’ve packed so you don’t have to dig through the top layer of clothing to get to what’s underneath. 6. ADD A DRYER SHEET TO YOUR SUITCASE. Before zipping your luggage, toss in a scented dryer sheet to keep your clothes smelling fresh, especially if you’ve packed shoes in there as well. 7. TUCK YOUR SHOES INTO SHOWER CAPS. Speaking of shoes, you don’t want the dirty soles rubbing up against your clean clothes for the duration of your journey. For a quick fix, pick up some cheap shower caps to wrap around your shoes. 8. PACK SMALL AMOUNTS OF LIQUIDS OR CREAMS IN EXTRA CONTACT LENS CASES. If you wear contacts, you likely have dozens of extra, perfectly clean contact lens cases floating around your home. For short trips that require only small amount of things like makeup or lotion, squeeze some into the little contact compartments for securely sealed, travel-sized amounts of your daily necessitates. 9. DON’T PACK WRAPPED GIFTS IN CHECKED LUGGAGE. When heading home for the holidays, be wary of putting wrapped gifts into checked luggage. If your bag needs to be opened for inspection, the wrapping will likely get torn off. So stow your gifts in your carry-on, use gift bags, or wait until you arrive to wrap your presents. 10. BE PREPARED FOR LOST LUGGAGE. Waiting at baggage claim for hours only to learn your suitcase missed your flight is every traveler’s worst nightmare. But you can ease the hassle by preparing for the worst: If you’re traveling with someone else, divide your belongings evenly between the two bags (rather than having a designated bag for each person). This way, if one bag gets lost, you both will have enough clothes and toiletries to tide you over until your bag makes its (fashionably late) appearance. Also, be sure to pack a change of clothes and some spare undies in your hand luggage. 11. SECURE YOUR RAZOR BLADE. You can use a large black binder clip as a cover for your razor to keep your fingers safe while digging around in your toiletries bag.